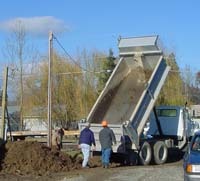 Donation pick ups: Tuesdays - roads and weather permitting. Call 208 610-7737 in advance to schedule a pick up. Idaho Panhandle Habitat for Humanity is currently accepting applications for the 2018 Habitat home. 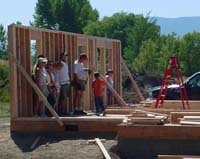 IPHFH builds homes in Bonner County for low to moderate income families in need of decent and affordable housing. Habitat partner families must save for a low down payment, help build the home with sweat equity hours, have a job/income, paid past bills and obligations in a timely and as agreed manner, and will purchase the home, upon completion, from Habitat with a zero interest mortgage, all conditions remaining satisfactory. Other criteria includes: currently face housing problems, have lived or worked in Bonner County for at least one year; and meet Habitat income guidelines. Partner families will learn about budgeting, home repair and maintenance. The Habitat of Humanity housing program is based on Christian principles of sharing and self-help. The basic idea is that prospective homeowners build their own homes in partnership with Habitat volunteers and donors. 1. Apply. Families fill out and mail in the application, which is forwarded to the Idaho Panhandle Family Selection Committee. 2. Credit/Background Check. A credit/background check is run on all applicants. A check in the amount of $18 for singles and $36 for couples must accompany the application. 3. Qualifications. The Idaho Panhandle Habitat for Humanity Family Selection Committee reviews all applications to assess housing need, ability to re-pay a mortgage and willingness to partner. 4. Home Visit. When it is time to select a new family, members of the Idaho Panhandle Habitat for Humanity Family Selection Committee makes a home visit to each qualified family. 5. Selection. After home visits with applicants are completed, the Idaho Panhandle Habitat for Humanity Family Selection Committee selects one family to be the homeowner recipient (family). 6. House Construction. Members of the homeowner recipient family begin contributing sweat equity hours, first on other Habitat homes and projects, and then on their home. 300 hours of sweat equity for single parents and 500 hours for couples is required for the selected recipient to be eligible for the new home. Recipients are also required to take a budgeting course, establish a savings habit and save at least $1,000 for house closing costs. It is generally about 18 months between selection of the family and the family moving into the home. 7. House Closing. The family signs an agreement (mortgage) to make regular monthly payments for 30 years, after which they become full owners of the home. Required monthly payments vary depending on each home’s building costs and the applicant’s ability to pay. 1. All work done by a local Habitat project demonstrates the love of God in Jesus Christ to meet the housing needs of God’s people. 2. Habitat depends entirely on the generosity of its donors and volunteers. No government funds are involved. 3. Each homeowner family has two partners, volunteers from the Family Selection Committee who work with the family to explain requirements, answer questions, arrange work schedules, give help with personal problems, and ensure that the family meets work, savings and house payment requirements. 4. The local Habitat committee is ecumenical, with representatives from businesses, churches and other members of the community. 5. Homes are built with no profit and no interest on loans. 6. Habitat follows an objective, non-discriminatory selection process in choosing the family. 7. Homes are simple, decent dwellings, built within the ability of the family to repay. 8. Homeowner payments are used to help build more homes for families in need. 9. Each Habitat chapter has its books audited annually. The books are open and available to review.